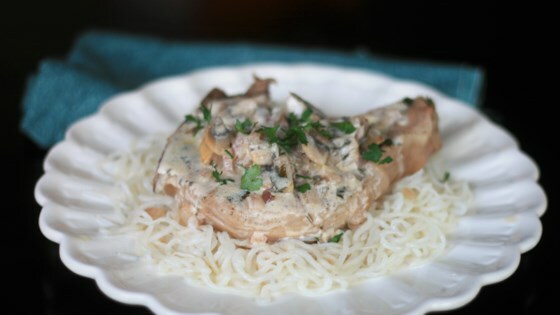 "This recipe came about when I had pork chops and mushrooms on hand and wanted something different. The richness of the mushrooms and the tang of the wine make these chops an easy and tasty weeknight main course! Serve on hot buttered bowtie pasta or rice with a tossed green salad for a complete meal." Melt butter in a large skillet over medium-high heat. Add mushrooms and onions; cook until tender, about 3 minutes. Add wine, parsley, garlic powder, salt, and pepper; cook until flavors combine, about 1 minute. Reduce heat to low; add pork chops and spoon some mushroom mixture on top. Cover; simmer until pork is slightly pink in the center, about 25 minutes. An instant-read thermometer inserted into the center should read at least 145 degrees F (63 degrees C). Remove chops from skillet and keep warm. Stir sour cream into the sauce in the skillet. Increase heat to medium-high; cook and stir until well blended and hot, about 3 minutes. Spoon sauce evenly over each pork chop. See how to make a simple but scrumptious one-pan pork chop meal. Dried parsley may be substituted for the fresh parsley.